A unique number given to Dell products that is often found on the bottom, side, or back of the product. As seen in the picture, this is an example of what the Dell Service Tag looks like, which in this case is next to the Microsoft Windows Product Key. This Service Tag can help identify your computer for online support and drivers and is also used to reset passwords on Dell laptop computers. How do I find the Service Tag? Make sure you have a Dell computer. Look on the back of the computer for a sticker that resembles the sticker on the picture shown on this page. The sticker should have "Service Tag: " somewhere on the sticker. 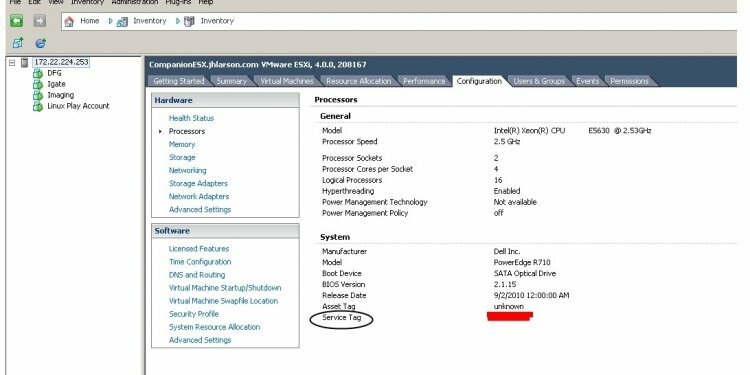 Tip: Although the majority of Dell computers and products have the Service Tag on the back of the unit, some Dell computers have the service tag on the side of the computer. Dell servers may have the Service Tag on the front, Dell projectors have the Service Tag on the bottom of the projector, and Dell handheld computers may have the service tag under the battery.